How many of you are familiar with The Nester? Or her annual October 31 day challenge, where she writes on one topic every day during the month of October? This years topic: vignettes. How genius is that? Vigenttes can be tricky for everyone, which got me to thinking. Maybe you'd all enjoy a little break down of how I put a vignette together. 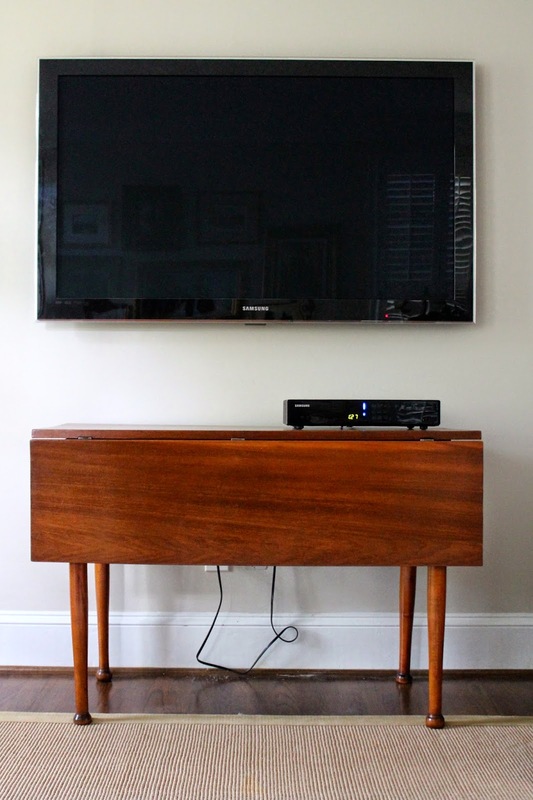 Even better, a vignette paired with a wall mounted TV. Fortunately for us, I recently acquired this beautiful drop leaf table from my parents during their downsizing. Before I brought it home, I thought it would be perfect under our wall mounted TV in the living room. But, once it was home and in place, I was a little less than thrilled. Time to build a vignette and see if we can make this table work. 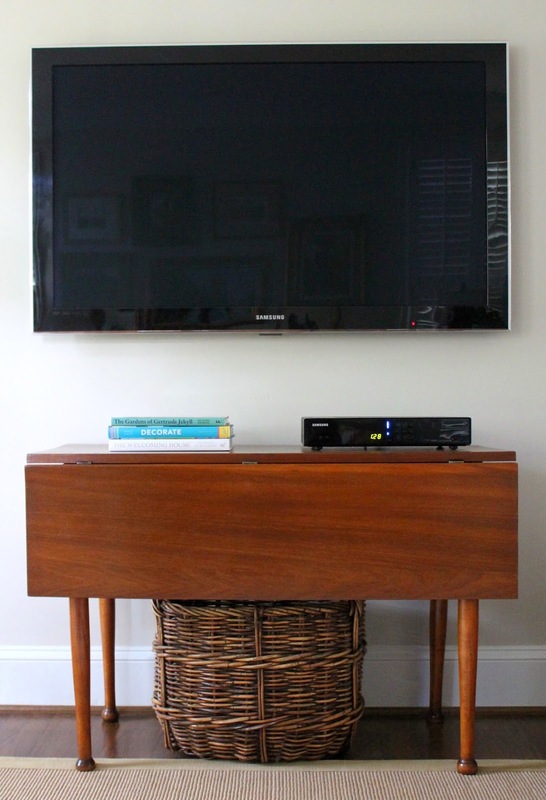 First things first, dealing with those necessary evils: the cable box and wall outlets. 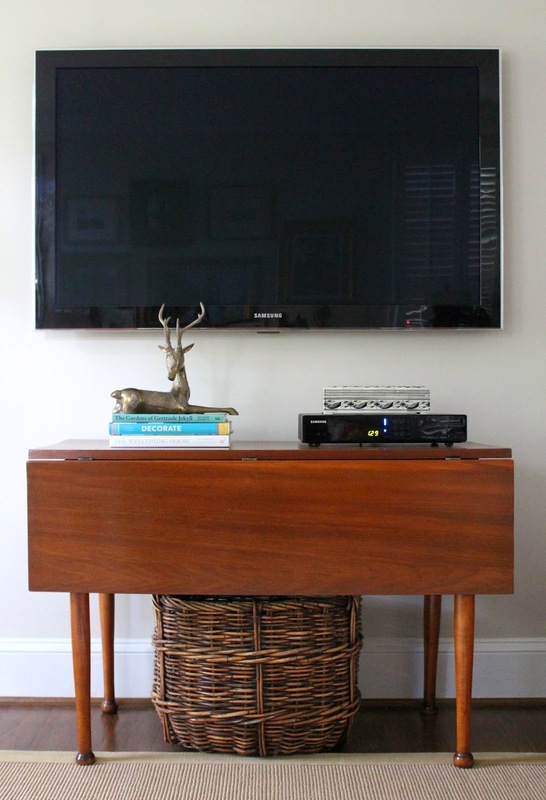 A basket placed under the table easily covers the wires/outlets - simple enough. The cable box, on the other hand, takes a bit more work. I started by stacking books to a similar height to offset the cable box. Next: create the distraction and add more height (especially in this situation because the table is a little low for the TV). 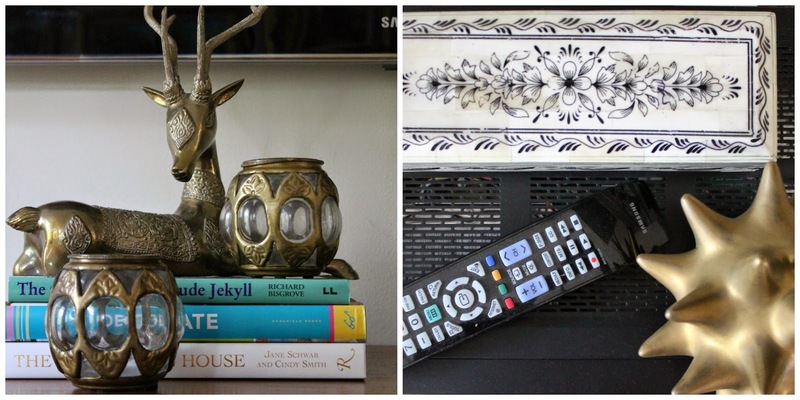 Concentrate on the stacked books (which is where you want the eye to settle, not on the cable box, obviously) by adding something eye catching - here I went with a brass reindeer, also courtesy of my parents. Growing up, I remember seeing the reindeer at Christmas time only - not here, baby. Year round. Times they are a changin'. To create balance, I also added a subtle bone inlay box to the cable box. It provides height without drawing a lot of attention. Now that the basic foundation is in place, it's just about adding additional pieces to round out the vignette. Remember: 3 is the magic number. Here I paired two moroccan inspired votive candle holders with the reindeer and an antiqued brass urchin atop the cable box. So much better and the table actually looks like it belongs here. It just goes to show what some proper accessorizing can really do for your home. Kind of like when we added the dark, heavy antique desk to our big girl's room and freshened the whole look with great accessories. Check it out here. Before you go dismissing free furniture, try a little accessorizing to make it work.